Montgomery Sisam is pleased to announce the Durham College Centre for Collaborative Education (CFCE), set to open in September of this year, is the recipient of a 2018 Urban Award from the City of Oshawa. The slender three-storey bar above a triangular plinth is an evocative gesture in an otherwise subdued architectural landscape. Visually and programmatically distinct, it is the inaugural phase of Durham College’s North Oshawa Campus Master Plan and will become a catalyst for future development, informing the design, program and integration of spaces and places to come. Program spaces suit a wide variety of academic and social needs, from those of aboriginal, LGBTQ and at-risk high school students to those of aspiring entrepreneurs and healthcare professionals. It also accommodates a range of informal study, social and amenity spaces to facilitate learning outside the classroom and enrich the quality of the campus environment. 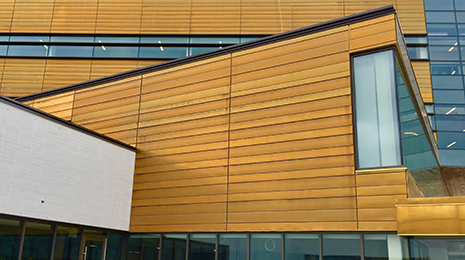 Limestone, white architectural block, wood soffit and a Muntz copper metal panel system commune to produce an expressive building skin that references the existing campus while maintaining an efficient, more modern enclosure. Permeability at grade create an engaging street presence that invites eyes and bodies to explore the dynamic series of spaces within. The 2018 Urban Design Award was presented to Durham College by the City of Oshawa during a special awards ceremony at the Robert McLaughlin Gallery on June 14th. The design of the CFCE was completed in joint venture with Architecture Counsel Inc. and delivered by Eastern Construction. More information on the new CFCE.